Tonya Curran, director of the Hand Art Center, stands between two paintings in the 29th Annual Undergraduate Juried Exhibition: “Donut Talk,” left, and “Lollygagging,” both by Hali Pollard. The 29th Annual Undergraduate Juried Exhibition will be held Friday, Nov. 2, through Dec. 7 at the Homer and Dolly Hand Art Center at Stetson University. An opening reception will be 6 to 8 p.m. Friday, Nov. 2, and award winners will be announced at 7 p.m.
Sixty-two student artists submitted 129 works to be considered for the show. Stetson art faculty chose 77 pieces from 36 artists to be exhibited. Gisela Carbonell, Ph.D., curator of the Cornell Fine Arts Museum at Rollins College, will judge the show and choose the winners of six awards, including the Ann West Hall Best of Show Award. Students will vote on the Student Choice Award. All Stetson students regardless of their majors are eligible to participate in the exhibition. This year’s show includes works by 16 non-art majors. Each student was allowed to submit up to four pieces. Other awards include: the Charlene Thomas Award of Excellence, the Rich & Lilis George Award to a Non-Art Major, the Li Hung Catron Award of Distinction, the Bobbi Baugh Award of Distinction, and the Paul, Elkind, Branz & Kelton P.A. Award of Excellence. 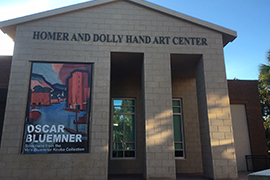 The Hand Art Center is located on the Stetson campus, 139 E. Michigan Ave., DeLand. Admission is free and open to the public. Designated parking is available in the lots at East Arizona Avenue. Center hours are 11 a.m.-4 p.m. Monday through Wednesday and Friday; 11 a.m.-6 p.m. Thursday and noon-4 p.m. Saturday. Closed on national holidays, holiday weekends and fall, Thanksgiving and winter breaks. Information: 386-822-7270.